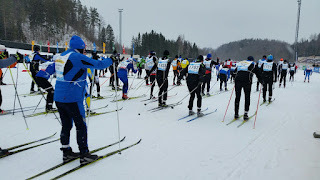 Today a coach ride to Tartu found us at an Expo building - an impressive place that may have supplanted a former Soviet airstrip - and registering for a ski race that takes place today and tomorrow. 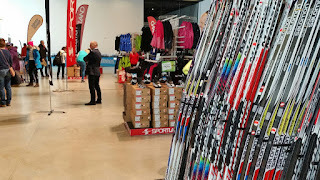 We also went shopping around the enticing stalls at the Expo, and at least five of us were captivated by some pretty Salomon trail shoes, which we snapped up for about half their price in the UK. 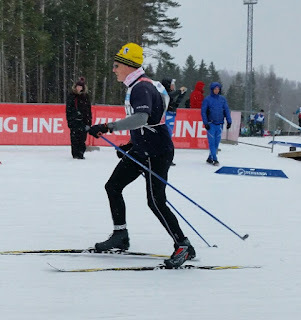 The Tartu Ski Marathon is normally a 63 km cross country ski race that travels through the Estonian countryside in the shape of a walking stick, starting in the stadium a few metres away from our front door, outside which Sue is pictured. 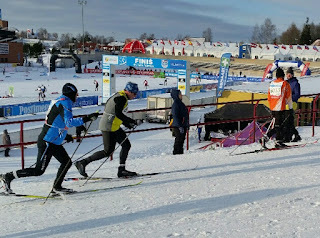 Last year the race was cancelled due to a paucity of snow. This year there is even less snow, but in a bid to avoid bankruptcy the organisers have elected to change the route to five and a half laps of the artificially produced course here at Otepää. 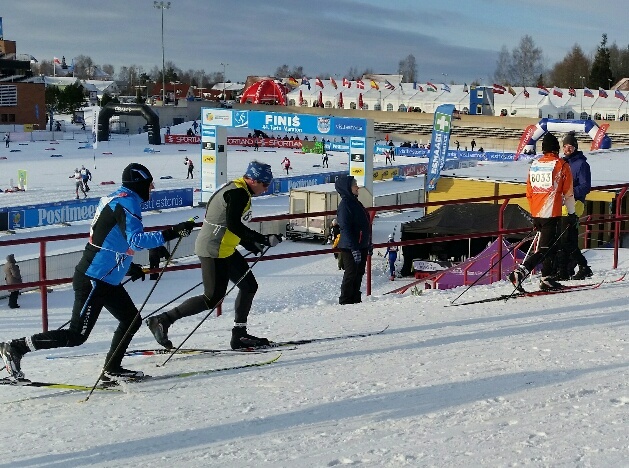 The race now takes place in six 'waves' of 500 to 600 people in each. There's also an option to do two and a half laps (16 km) rather than the full 34 km race. We are all entered for the 34 km races that start at 11 am (for fast skiers) or 2 pm (for slow skiers like me and Sue). The 'elite' start at 9 am and should all finish by 11, whereas people like me can hope for around 4 hours, depending on the conditions. This afternoon three of our number, Sam, Shane and Andy, elected to add one of today's 16 km races to their itinerary. Sue and I may have joined them but we only have insurance cover for ski racing for one day - tomorrow! 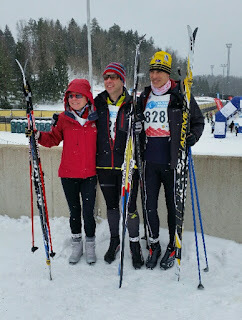 The dynamic trio are pictured before the race, and I managed to snap the start, and Andy and Shane during the race. 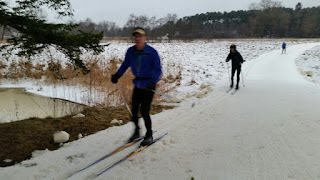 I have pictures of all three finishing, but those were taken with my proper camera so they will need to be downloaded at home before they appear here. A fair number of us stayed out on the cold but sunny afternoon to cheer them on. Given the slow conditions they all did brilliantly. Andy took roughly 1.09, Shane 1.22 and Sam 1.36. Well done, all of you. We hope you haven't worn yourselves out for the longer distance tomorrow. Lumi, the best restaurant in Otepää, beckons again tonight. We were there yesterday and will be again tomorrow, by which time we should have worked our way through the menu. Luckily, the food is great. 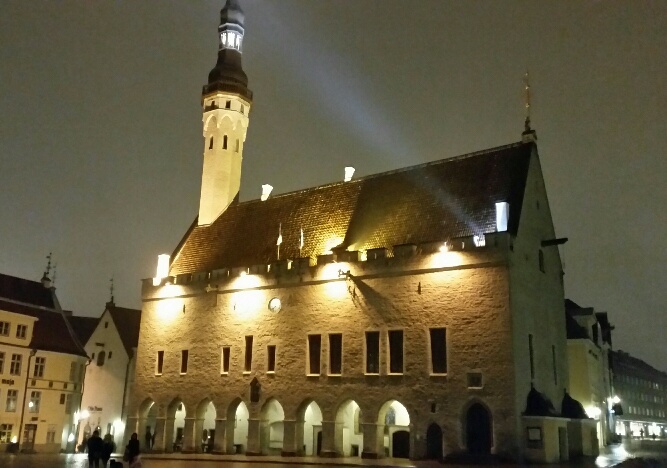 Estonia in general is very much a European country with the high standards you'd expect from any honourable member of the EU. They don't disappoint, and many people have taken the trouble to learn English, which is most considerate. 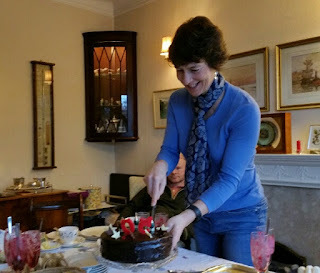 Happy Birthday to Sue - 50 today. 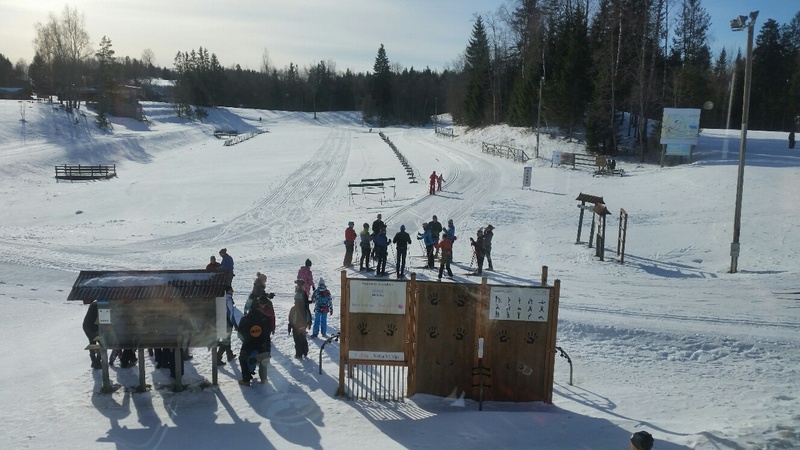 An hour's bus journey through villages with washboard houses with corrugated iron roofs saw us at Haanja ski resort, next to the highest point in Estonia and maybe all the Baltic states. There's a tower to celebrate this achievement - pictured at the bottom, the tower looms above the 318 metre summit of the hill. It was closed today but apparently enjoys views over nearby Russia and Latvia from its upper viewing platform. The skiing here was excellent, even for me in my one-armed state of incapacity. The top picture shows our group about to set off after some warming up, leaving Sue and me briefly with cappuccinos in the café. We soon caught up and enjoyed a switchback trail down to a lake. After a couple of laps of the lake, someone suggested a relay race for about ten of us who were present. Against better judgement I took part. Did I fall or did Ellie push me? Anyway, my bad shoulder took another jolt so I judiciously made way for Stephen in the second run. Sue is pictured, now well ahead of team 2, thanks partly to my replacement. 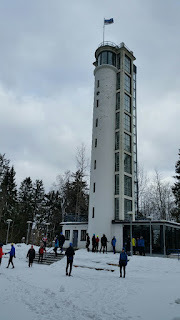 Then we had lunch in the café, visited the tower, and returned to Otepää after about 12 km of skiing according to my Garmin. 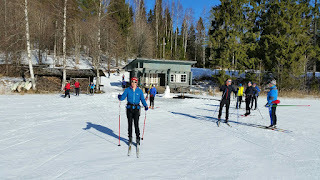 Roy and I enjoyed a cuppa whilst Sue went back to the Otepää ski loop and Susan, who today just skied locally to test her calf injury, was out walking somewhere. 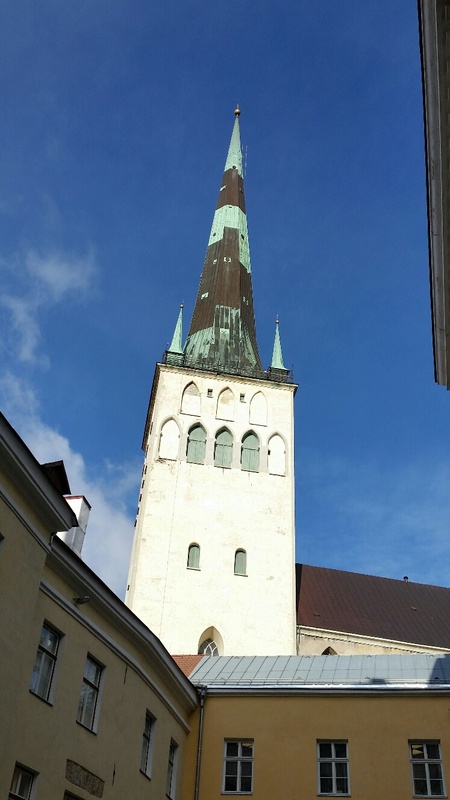 Today was spent in the village of Otepää. 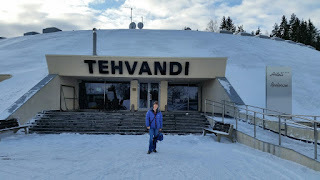 We are staying in the Tehvandi Hotel, known to the locals as the Pentagon, which forms part of Tehvandi Sports Centre. The hotel is horseshoe shaped, with a grass roof. The centre (pictures to follow in due course) was built in 1978 as a complex for preparing the winter sports team of the former Soviet Union. 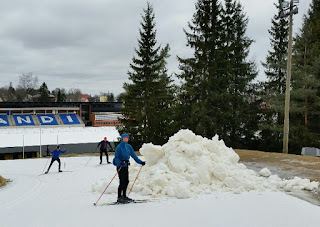 It continues to serve that function for the Estonian team and is a venue for World Cup skiing events, some of which have taken place here in recent days. Currently it has a 6 km classic cross country ski trail on artificial snow, enhanced by a few centimetres of the real stuff that fell overnight. 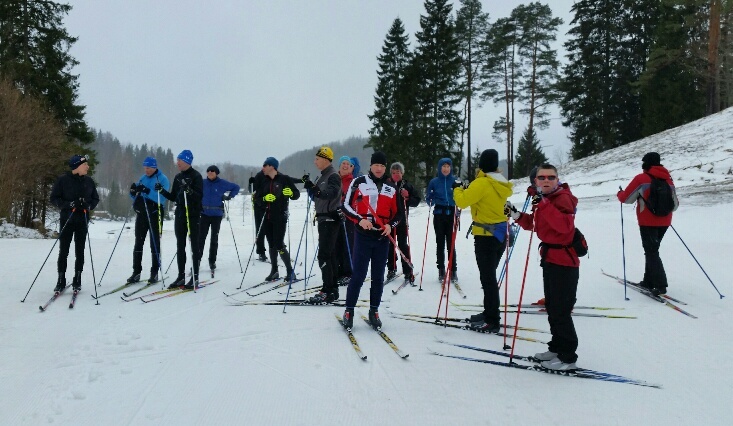 This morning we had a group tutorial from a chap called Marti, before skiing slowly around the easy 6 km trail. 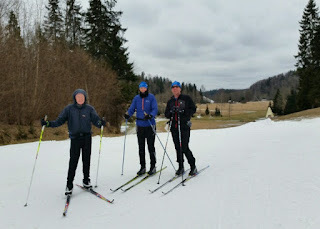 My GPS recorded about 10 km of skiing. The second picture shows some of our group milling about whilst waiting for Godot. 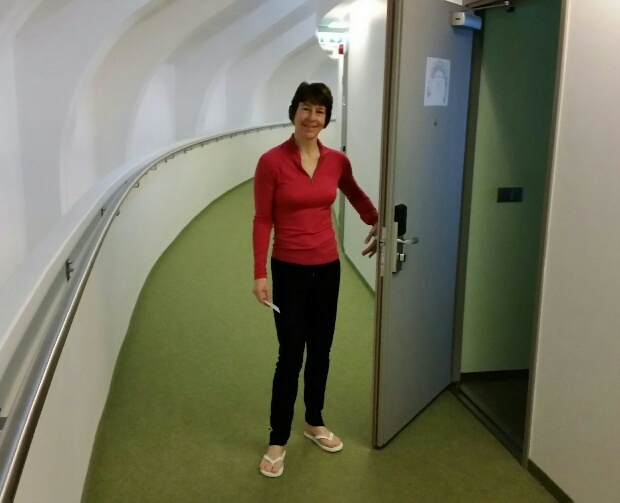 Returning to the hotel (a 100 metre walk) I slipped on some ice. Very careless - it hurt my already damaged shoulder. 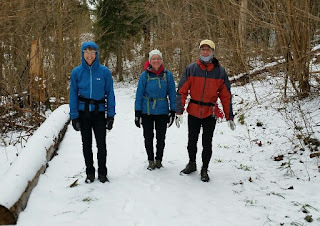 So this afternoon Sue and I skipped skiing - there are only so many times you can enjoy skiing the same 6 km of track - and went for a walk with Susan (who is crocked by virtue of a calf muscle strain) and Roy around the periphery of the ski trails. About 8.5 km for me, more for the others who after coffee and cake at a nice café headed off to explore a local fort. 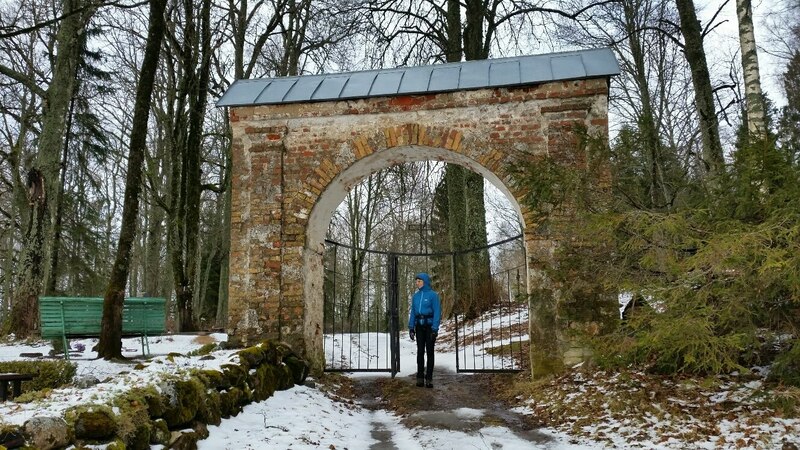 The bottom two pictures were taken on this pleasant stroll, the bottom one being at the entrance to a large cemetery. Last night Sue and I enjoyed a lovely meal with Susan and Roy at the Kaerajaan restaurant in Tallinn's vast Town Hall square. Tallink Spa and Conference Hotel at which we were based for a couple of days. This morning's three and a half hour bus transfer to Otepää took us past forests of silver birch and pine, across flat terrain with empty fields that no doubt will yield grain later in the year. We had a short break for elevenses at a café by a windmill. No sign of any livestock, just a few crows and birds of prey. 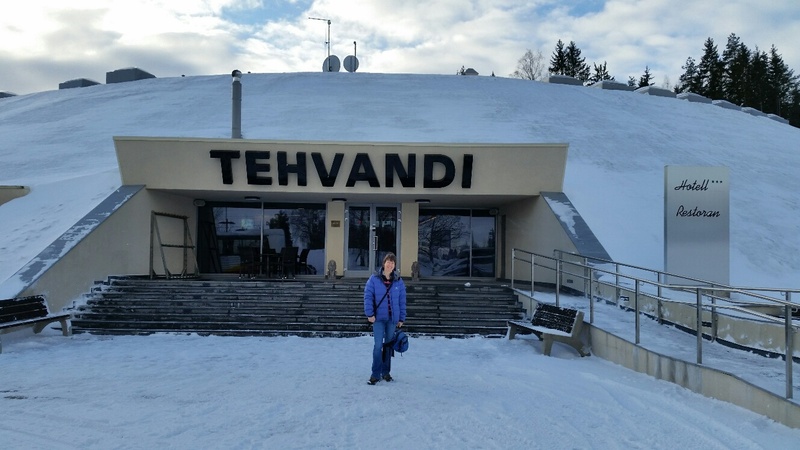 We skirted around Tartu to arrive at our nice hotel in Otepää - Tehvandi Hotel - in time for a buffet lunch. This is a skiing trip. The bad news is that there seems to be no snow of any note in Estonia. The good news is that there appears to be a snow factory from which lorry loads are being unloaded at this venue. Sue is pictured on our short course in front of a freshly dumped pile. The lorry has just driven off. The bottom picture shows a few of us at 'the end of the snow'. It comes to an abrupt end above a pretty valley. Despite the constraints, most of us skied around in circles for over two hours in bitterly cold conditions. 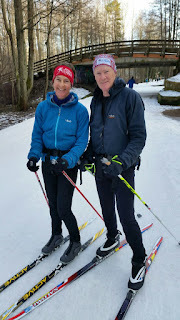 Sue and I covered just over 16 km. We spent a morning with the 'gang' - 18 or so of us on what is left of a suburban ski trail, ie the artificial snow bit. 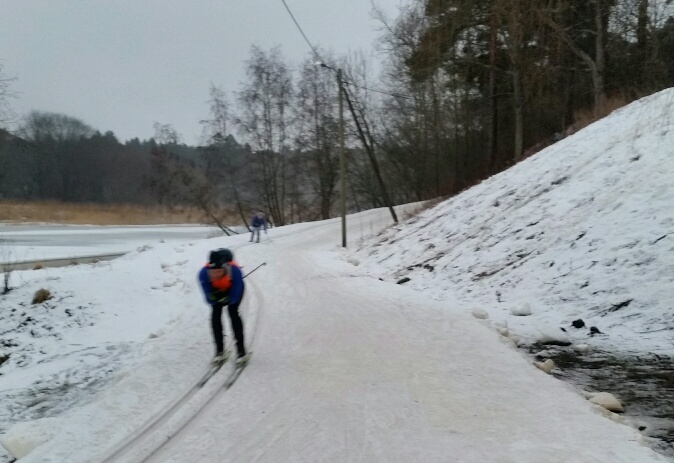 It was icy, but with my own ski shoes and some waxless Salomon skis I was able to enjoy about 11 km on the icy 2 km figure of eight track, as best I could under the circumstances, ie a skiing holiday with no snow. This afternoon we enjoyed a guided tour of Tallinn. We'd have enjoyed it more if we had bothered to deploy the down jackets we'd brought for occasions such as slow moving guided tours in sub zero temperatures with a bitter wind from the north. Hot chocolate and cake at around 3.30 pm were more than welcome! The village square, on our way to a restaurant that I'm told was called 'The Golden Pig'. Sue and I enjoyed the chicken, others wrestled with their pig shanks (imagine lamb shank in giant dimensions); the beer was excellent - how could they fail, the brewery was next door - and the overall experience was most pleasurable. 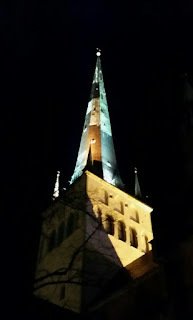 It's a dull day in Tallinn and what snow there is is mainly artificial, although we did land in a snow shower. There are 21 of us on this trip, including guides and hangers on. 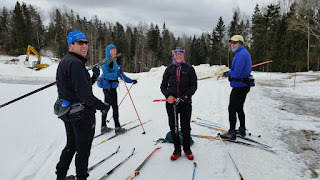 After assembling at a comfortable hotel we wrestled with ski hire and headed out to a 3.5 km ski circuit along the lines of the Mooney's Bay circuit we practice on in Ottawa. 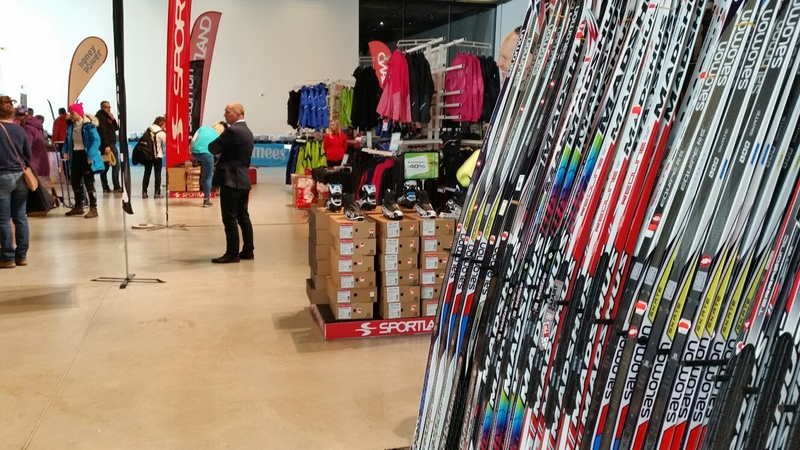 But there's more snow there, and I have my own skis. 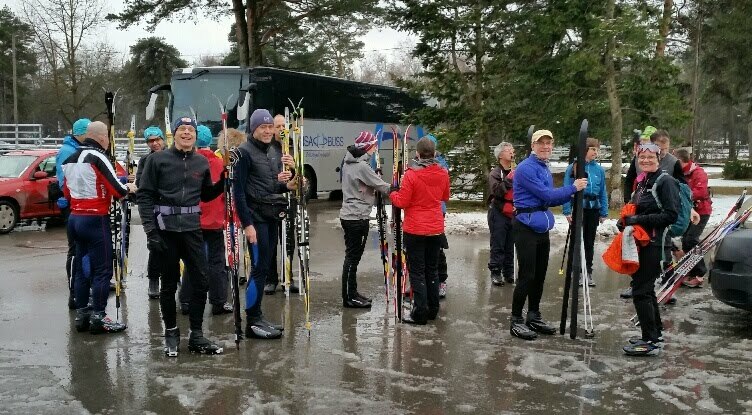 Today most people got sorted out but a couple of us finished up with waxing skis but no wax. 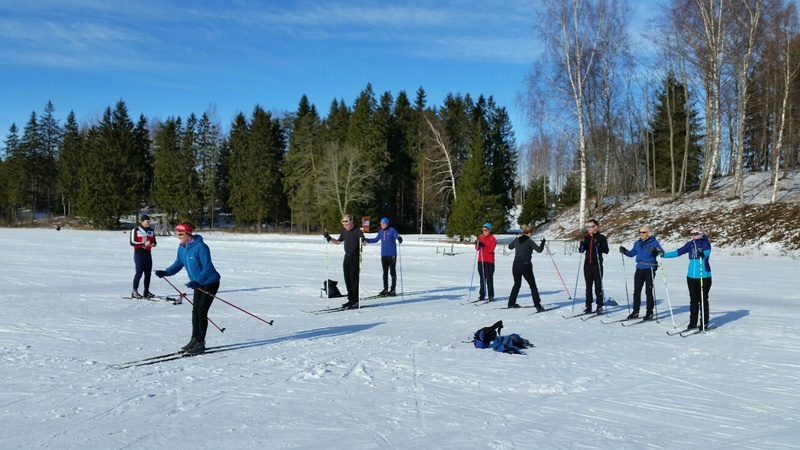 That's not really much fun, so a 5 km ski was enough for me. Others, equipped with the sort of waxless skis I've ordered for tomorrow, managed better. You may be able to spot Sue, Ken (Helen went shopping) and Susan and Roy in the top photo. We'll get to know the others as the week progresses. 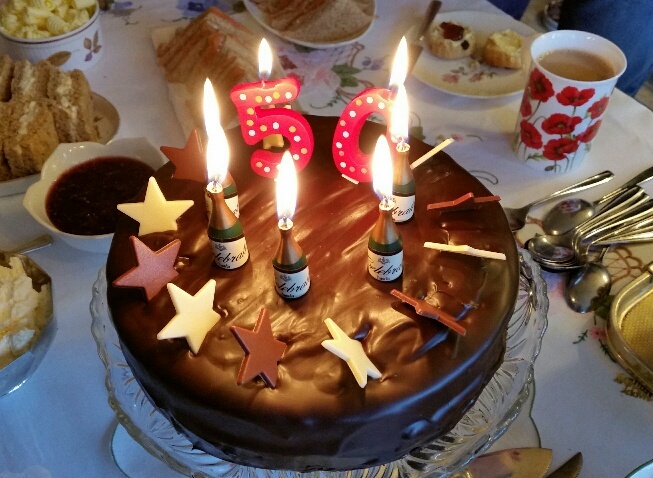 En route to Gatwick - an impromptu birthday party.